RIO DE JANEIRO, BRAZIL – People from all around the world have been mourning the death of chef, writer and self-described ‘enthusiast’ Anthony Bourdain. He left his mark on innumerable places and Rio is no different. 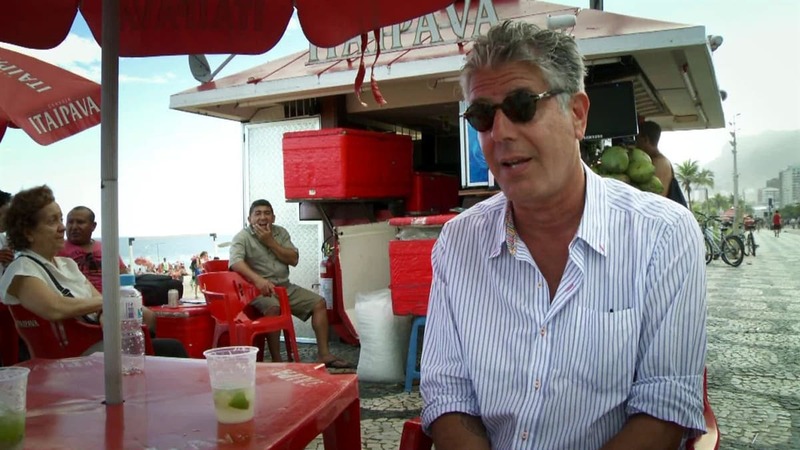 To celebrate his memory, here is how to experience the Cidade Maravilhosa as Anthony Bourdain did. Anthony Bourdain was famous for finding the authentic and ‘locals only’ spots of any place he visited, and his time in Rio was no exception, photo internet reproduction. 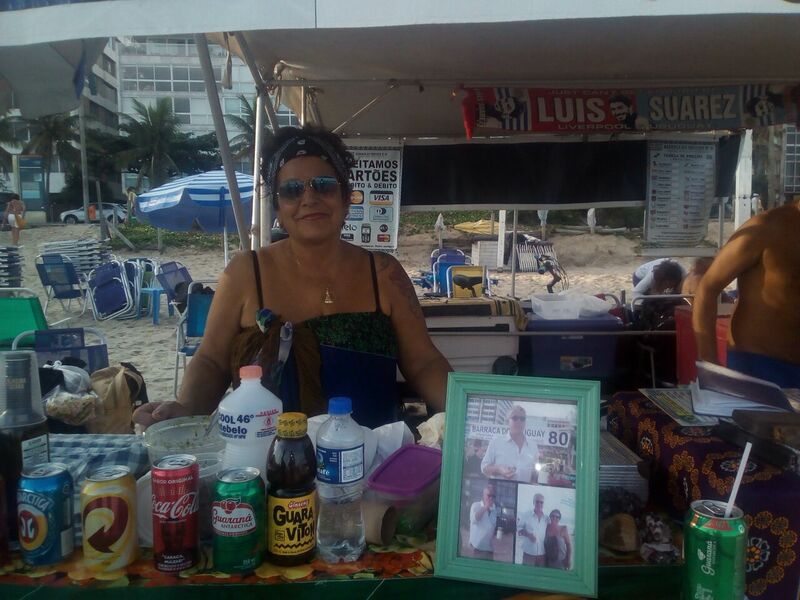 Dona Glória, the owner of Barraca do Uruguai, still keeps Anthony Bourdain’s photograph proudly on the table where she serves her excellent sandwiches, photo internet reproduction. The largest favela community in Rio is also home to culinary treasures, such as the ‘Barraca Nordestina,’ which Anthony visited with Paulo Amendoim, a local tour guide who still operates in the area. In the spirit of down-to-earth good food, Anthony Bourdain wasn’t afraid to venture into Rio’s underrated Zona Norte (North Zone) to one of the country’s best food markets, CADEG. He took his wife to Adega Cesari, a restaurant within the market, to sample some of the city’s finest churrasco (Brazilian barbecue). While visiting Rio, Anthony also stopped by Galeto SAT’S in Copacabana to dine on its legendary barbecued galeto (baby chicken). They now have a signed picture hanging near the spot where Anthony Bourdain enjoyed their galeto, brocolli rice, potato chips and farofa as well as a few of their wide variety of cachaças. 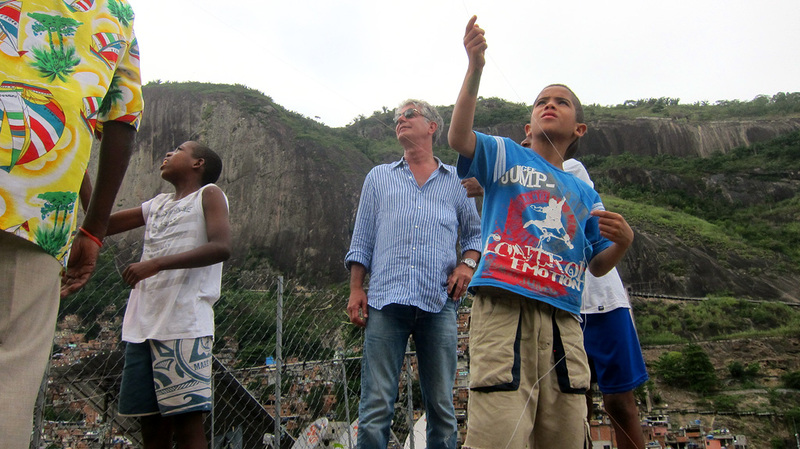 Anthony Bourdain was not afraid to go to places that are off the usual tourist trail, such as the city’s biggest favela community, Rocinha, photo internet reproduction. Local chef Danni took him to her favorite bar, Armazém São Thiago, or ‘Bar do Gomes’ as it’s more commonly known, where they enjoyed the ice-cold chopp beer that is the boteco’s staple along with some of its bar food, such as carne seca (dried meat), bolinho do bacalhau (small fried balls of potato and cod), and, of course, a mortadella sandwich. “The heart and soul of Rio is places like this.” Anthony Bourdain commented, and, much more so than any of the usual travel guides and TV shows, he really did seem to get to the heart and soul of what makes Rio such an enchanting city.